A highly versatile saddle based on the Atena model, its essential design, its lightness, and its elegance make it stand out. With Atena Race both the rider’s seat-and-leg position, about and down the horse’s flanks, as well as his/her comfort is excellent. The seat is extremely soft thanks to the double stuffing. The panels are broad and soft with a double layer of felt and latex lined with leather. They come in a version that is standard or, for horses with a raised croup, one that is slimmer in the saddle’s central part. An notable feature of the stirrup bar is its location in two positions, front or back according to whether the rider needs to assume a more forward or rearward seat. 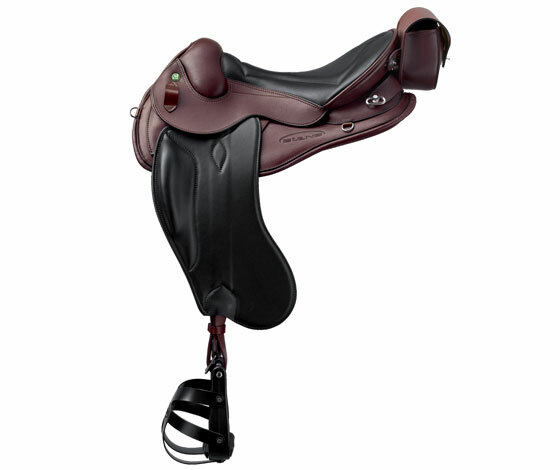 The saddle is fully lined with new oiled and water-resistant leather and is remarkable for offering the softness normally associated with calfskin combined the toughness of leather. Thickness: 3.3 mm. Weight: 7 kg Seat size: 17” and 18”. Colours: brown.